It's easy to know when it's time for a vacation. You may stare wistfully in the sky at every passing plane, or find yourself hyperventilating come Monday morning. But figuring out where to go on vacation can be a chore (although it's probably not the most unappealing task on your plate). We've taken it upon ourselves to make the job a little more manageable by filling you in on where you can catch a festival held only once every couple of decades, new hotels to visit before the crowds do, and how to score great deals at renovated resorts bouncing back from storm damage. 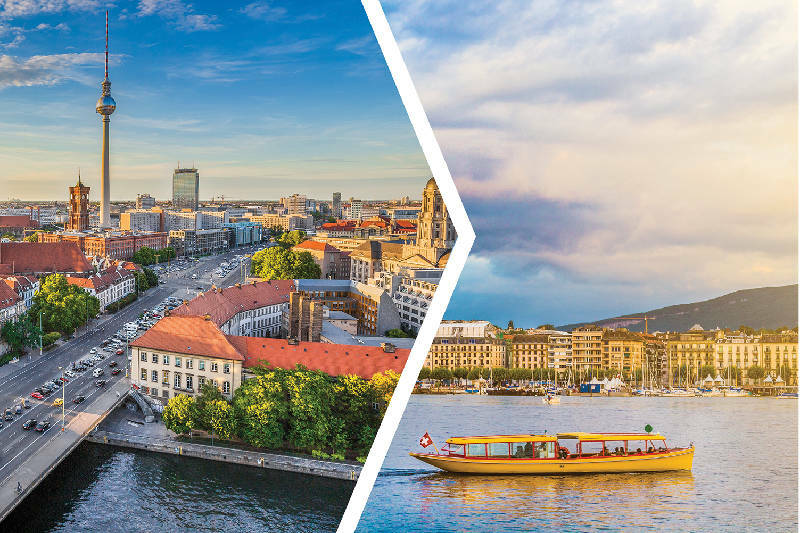 Whether you typically spend your time off lounging by the beach, attending concerts and festivals, or acquainting yourself with the cultures of faraway lands, we have an escape or two that'll make you wish for more vacation days, as if you didn't already. With its close proximity to Chattanooga, you've likely found your way up to Music City, USA, aka Nashville. But if you haven't made the trip to Austin, Texas, known as the Live Music Capital of the World, now is a great time to check out all the city has to offer. Austin boasts more than 250 music venues and several well-known music festivals, including SXSW and Austin City Limits. It's also a magnet for foodies. Pay a visit to Franklin's Barbecue, home to the world's first James Beard Award-winning barbecue pitmaster, Aaron Franklin. He's also the creator of Hot Luck, a music and food festival held Memorial Day weekend in Austin and which pops up in various cities around the country year-round. This year the city is gaining 1,000 new hotel rooms, further evidence of its status as a destination on the rise. Among them is The Faulk at Green Pastures, a 99-room boutique hotel at iconic venue and restaurant Green Pastures. Established in 1893, Green Pastures recently reopened its fine dining restaurant and event venue, Mattie's, after extensive renovations, and The Faulk is set to follow sometime this year. The 76-room East Austin Hotel, with options ranging from cabins to poolside suites to typical single or double rooms, was set to open in the East Austin entertainment district early this year. Targeting millennials, The Proper Hotel is scheduled to open a luxurious 245-room property this summer designed by Kelly Wearstler, author and top interior designer known for designing hotels such as the Viceroy chain and the homes of celebrities such as Gwen Stefani and Cameron Diaz. Located downtown in the Second Street district a block from Lady Bird Lake, the hotel features a rooftop pool deck, several new chef-driven dining concepts, and a spa and wellness center. IF YOU'VE BEEN TO EUROPE'S MAJOR CITIES, TRY SWITZERLAND'S LAKE GENEVA. Berlin vs. Switzerland's Lake Geneva. The area on the northern shore of Lake Geneva between Lausanne and Montreux is known as the Swiss Riviera, and is typically warm enough for swimming from June to September, even as you gaze up at snow-capped peaks. You'll also find five-star hotels, Michelin-starred restaurants and top-notch cultural offerings on par with those in much bigger cities, minus the throngs of people. Held just once every 20 years, the Fete des Vignerons (Winegrowers Festival) will take place July 20 through Aug. 11 this year in Vevey, located on Lake Geneva in the Lavaux wine region. Guests will have the chance to sample rarely exported wines made from the Chasselas grape variety, which has been grown there since the 11th century. UNESCO recognizes the festival as one of the world's most important cultural heritage events. In nearby Montreux, the Montreux Jazz Festival, the second-largest annual jazz festival in the world, is set for June 28 through July 13 this year. While you're in the area, pay a visit to Chillon Castle, which inspired Lord Byron's poem "The Prisoner of Chillon." Stay in the middle of all the Fete des Vignerons festivities at Grand Hotel du Lac, a Relais & Chateaux property established in 1868 featuring spectacular views of Lake Geneva and a Michelin-starred restaurant. Rooms start at $266/night. Another classic hotel option is Fairmont Le Montreux Palace, a gem from the Belle Epoque located in Montreux, about a 10-minute train ride from Vevey. Room prices are comparable, starting at $275/night. LOVE THE BEACHES ON FLORIDA'S 30A? TRY THE FLORIDA KEYS. 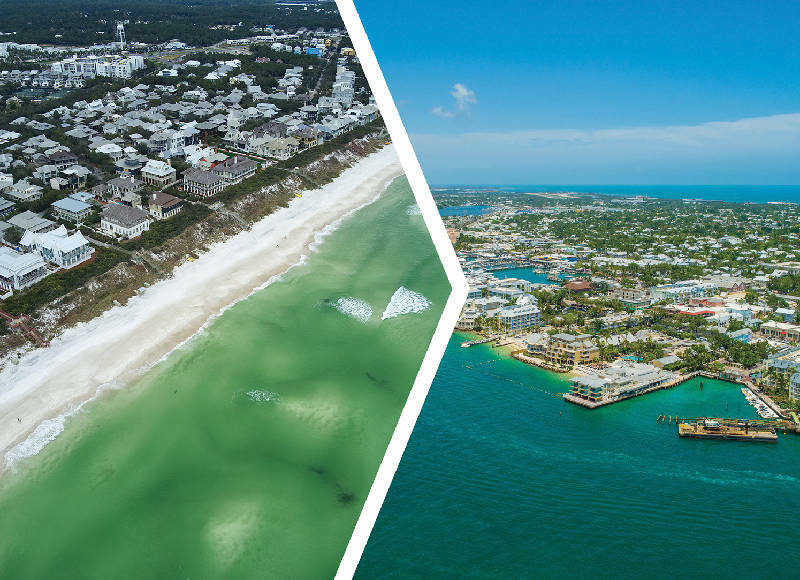 Beaches on Florida's 30A vs. the Florida Keys. The Keys took a pummeling by Hurricane Irma in 2017, but resorts have reopened — and many took the damage as makeover opportunities. Take advantage of specials that some of the recently reopened resorts are offering in early 2019, as well as the great fishing and diving opportunities for which the Keys are known. Dry Tortugas National Park, to which you'll need to take a ferry or charter a boat or seaplane, is worth a day trip to snorkel, fish, collect conch shells on the beach and tour the massive Fort Jefferson. On the mainland, don't miss Ernest Hemingway's former home, now a museum. The newly renovated Parrot Key Hotel & Villas in Key West, which reopened in November, features all new exteriors, interiors and landscaping, a new poolside bar, a restaurant called The Grove Kitchen which serves three meals a day, and new waterfront villas. Guests have the use of the resort's four pools, and bicycles and Jet Skis are available on-site. Room prices start at $268/night. Part of Hilton's Curio Collection, the refurbished Baker's Cay Resort is located along Florida Bay on a former pineapple plantation in Key Largo, the northernmost of the Keys. Each of the 200 guestrooms and suites sprinkled around the 13 acres boasts its own private balcony. Accommodations range from 300-square-foot Hammock View rooms to one- and two-bedroom waterfront suites, at prices starting at $282/night. The additional daily resort charge includes internet, bicycles, beach chairs, umbrellas, hammocks, paddleboards, kayaks, and recreational, beach and pool activities. LOVE TULUM, MEXICO? TRY BELIZE. Beaches of Tulum, Mexico, vs. Belize. If you're looking for a laid-back vibe and Mayan ruins, try still-under-the-radar Belize. Bordered by the world's second-largest barrier reef, the small country is a prime diving destination that has yet to be overrun by tourists. Along with world-class diving and saltwater fly-fishing, the country boasts more than 450 offshore cays, rivers for rafting and kayaking, and Central America's largest cave system. 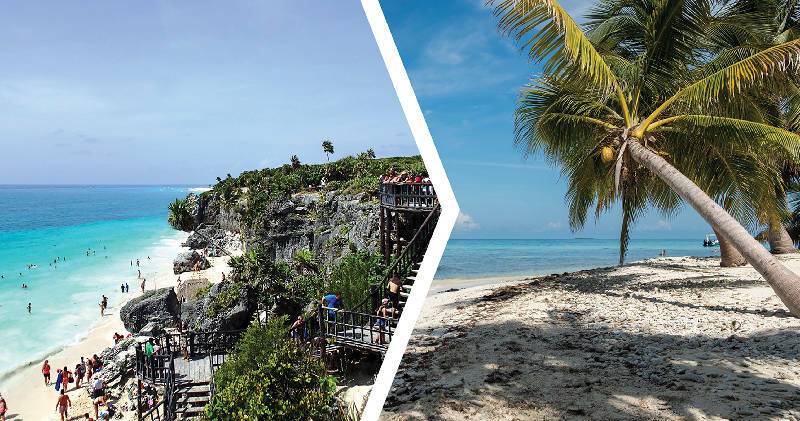 You can also head into the jungle to explore more than 600 Mayan sites, such as the towering pyramid of Caracol, without the crowds you'll find at Riviera Maya destinations like Tulum. Belize is known for its biodiversity and is home to the Cockscomb Basin Wildlife Sanctuary, the only jaguar preserve in the world. No wonder Belize, Central America's smallest country, was named No. 10 on Lonely Planet's list of the best places to travel to in 2019. Another reason to visit Belize is the influx of recently opened and soon-to-open luxury properties, like Leonardo DiCaprio's Blackadore Caye eco resort, set to open later this year. The acclaimed movie star sought to turn the private 104-acre island into the "greenest" luxury resort ever built, where people could live in harmony with nature while helping to preserve it. Designed to increase the health of the species living there and of the surrounding water, the health- and wellness-focused resort is entirely powered by the sun, and is home to a research station studying climate change and the impact it has on habitats. Until the resort's debut, you can stay at Cayo Espanto, where DiCaprio stayed during the 2004 vacation when he first discovered the island he later purchased. Espanto's seven villas offer an ultra-exclusive experience. (Think iced towels delivered to you while sunbathing.) Accommodations start at $1,974/night. Or, you can still jump on the royalty-owned Hollywood resort trend with Francis Ford Coppola's Turtle Inn, a casual property on the Placencia peninsula, with 25 rooms built in the indigenous style with panoramic views of the sea.